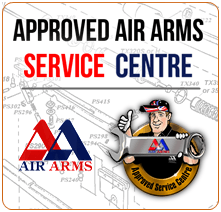 Airguns in the UK are subject to the firearms acts, under the Firearms (Dangerous air weapons) rules 1969 they are classified as low powered Air Weapons and as such they are restricted to a maximum power of 12 foot pounds force for a rifle and 6 foot pounds force for a pistol. Above 12ftlb a rifle is classified as a Section 1 Firearm and requires a licence called a firearms certificate, and a pistol above 6ftlb is again a Section 1 Firearm requiring a firearms certificate in the UK. The definition of a firearm under the act is "a lethal barrelled weapon of any description from which any shot, bullet or other missile can be discharged" it further defines "lethal weapon" as "a weapon capable of firing a projectile with sufficient force to inflict more than a trivial injury i.e.. with sufficient force to puncture skin". The Home Office consider the lowest level of muzzle energy capable of inflicting a penetrating wound is one foot pound (1.35 joules) hence guns producing less than 1ft/lb are not covered by the act and therefore not classified as air weapons or subject to any restrictions. Any person under the age of 14 years of age may not purchase or own guns or ammunition. Persons aged between 14 and 18 years may not purchase guns or ammunition but may borrow or have them purchased on their behalf by some one over 18 years of age. Persons over the age of 18 years may purchase guns and ammunition, the guns having a power less than the UK legal limit. Guns over that limit require a fire arms certificate to be granted before they can be owned. A person aged between 14 and 18 can use an airgun on private property where they have a right to be, without supervision. A pistol can only be carried by someone over 18, again it must be unloaded and in a securely fastened case. 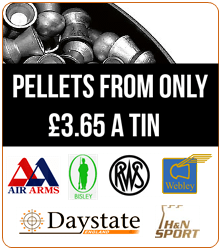 Airguns can be paid for over the telephone (if you are 18 years old or older) and then we would be happy to deliver to your door within 20 miles of our shop free of charge, alternatively we can, by prior arrangement with your nearest firearms/airgun shop send it to them for collection by yourself I.D. would be required. The local dealer would make a charge to cover his admin costs. You must be over 18 years of age and have proof of this with you to collect a gun on this basis. the UK to other countries. This includes arms, ammunition and related hunting equipment. This means all export of air rifles, air pistols, ammuntion, knifes, scopes and lasers is not permitted by international laws, therefor no international orders can be taken for the said products.